When a machine goes down it is costing your company time and money. Being able to identify symptoms of a failing spindle will allow you to plan maintenance around your production schedule. This article will tell you how to spot two common issues that result in spindle failure. The first issue is bearing wear and failure. When spindle bearings begin to wear there will be noise and/or excessive heat coming from the spindle. If you start to notice a poor finish on your product that also can be caused by a worn or failing bearing. If you have noise and/or excessive heat coming from the spindle Centric Inc. suggests you send the spindle in to us for diagnostics and service. Centric Inc. offers maintenance solutions ranging from simple service to complete spindle rebuilds with new bearings. A poor finish can also be a symptom of the second issue; excessive tooling journal wear. If the moulder is running hydro-loc heads on a spindle with excessive wear on the tooling journal the hydro-loc head my not be securing properly which could result in spinning the head while on the spindle. If running a straight bore head on a spindle with excessive wear; too much ‘play’ between the tooling bore and the spindle will result in vibration and poor finish on material. If you notice vibration coming from the head or an excessive amount of ‘play’ between the bore of the head and the tooling journal suggest having the spindle serviced. Centric Inc. will chrome and grind your spindle back to its original diameter. Centric Inc. always recommend to chrome and grind bearing diameters and tooling diameters at the same time to ensure concentricity. 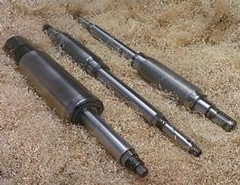 The two types of spindles found on moulders are the vertical spindles (side heads) and horizontal spindles (top/bottom heads). Some moulders may have an adjustable last head that does not fall into either category listed above. It is important to check these spindles for new signs of wear when installing a new set of heads. Stations that experience frequent tooling changes may need chroming and grinding sooner than others, also, head stations that hog large amounts of material may need bearings serviced sooner than other spindles that “work less”. Services Available at Centric Inc.
Centric Inc. is proud to offer a wide range of spindle related services. Centric Inc. spindle services include; Disassembly, quality checks, new bearing assembly, and break in. Centric Inc. will repair worn or damaged spindles by chroming and grinding all bearing and tooling journals. Centric Inc. can also rebuild your damaged spindle with new high-precision bearings and synthetic Kluber grease. If your spindle is beyond repair Centric Inc. can also build you a complete new spindle!! For all rebuilds, Centric Inc. will run a break-in procedure for a minimum of 8 hours to ensure that when you receive your spindle it is ready to install and run right out of the box.